True Life: I don’t know what book I’m reading. No, really. I started this book thinking it was a different book, then realized almost halfway through that none of the characters mentioned had showed up and the story line was extremely different from what I’d read in the summary. Somehow, when the publisher uploaded the book I was supposed to read, this got uploaded instead, but with the cover and acknowledgements from the first book, so I was clueless to the fact that what I was reading what not what I was really reading. Make sense? The general premise of the story is that a woman who never thought she’d find love has just married the perfect man. 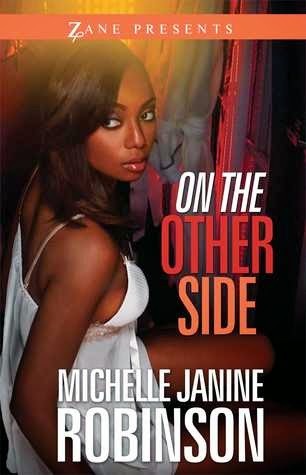 Her mother and best friend can see right through him, but as Micki Howard says, “when you’re in love, can’t nobody tell you nothin’.” Her family and friend’s concerns are warranted as her dream man turns out to be an abusive and controlling nightmare, a nightmare that starts on their wedding night and doesn’t end until she finds the courage to walk away. Since I had already invested an hour in On the Other Side, and it wasn’t horrible, I figured finishing it wouldn’t hurt. I did have a few problems with the author’s timeline and thought process though. For example, she had the female protagonist telling her husband that she wasn’t sleeping with her female best friend, yet the husband never implied that she was. So I’m not sure if some lines were edited out and the author just failed to circle back and update the conversation or what. In another instance, the husband and wife had just woken up extremely early and commented on how early it was, then turned around and mentioned having a burger. Unless hamburgers are the norm for breakfast now, it just seemed like another instance where the timeline should have been cleaned up better. While On the Other Side was a fairly decent read, the timeline issues and the script discrepancies stood out and distracted from the overall story line. Disclaimer: Copy of book received from publisher, opinions are mine.